PPP and Civitas don't agree much, so when we do agree on something you can pretty much bet it's true. And one thing we agree on is that the results of today's WRAL/Rasmussen poll sound pretty fishy. We can't know for sure though, because Rasmussen didn't tell us the party balance of the folks they polled. Or the gender balance. Or the racial balance. Or the age balance. Or pretty much anything that would let us make a basic analysis of the validity of their poll. You get all those things in any PPP poll, which raises an interesting question. Isn't the media supposed to be a beacon of transparency, certainly more transparent than our 'partisan' polling company? WRAL isn't the only tv station in the Triangle commissioning a poll. WTVD has been getting a monthly poll too. They get it from Survey USA and it comes complete with all the useful information you would want to analyze a poll. In my opinion WTVD has it right and WRAL has it wrong. WRAL should either make Rasmussen release the demographic info on its poll so we can see what factors might be leading to this seemingly too friendly to Democrats poll, or else they should contract with someone else to do their poll who will release that information. It's perfectly logical for media outlets to commission polls- but if they're going to, they should make an extra effort to make sure they're getting a good poll and abiding by the same transparency that they expect out of the decision makers they cover. I guess Rasmussen is doing monthly polls now for WRAL. I haven't had much time to read this latest one but it tests the gubernatorial match ups and shows Bev Perdue and Richard Moore doing better against the Republican contenders than our last poll did. Most notably it shows both of them leading Pat McCrory by six points, whereas we had it tied just last week. Rasmussen doesn't release its topline demographic information so it's hard to know how accurate they are. Of course it's fine with me if they're right and we're wrong. Bob Orr, Bill Graham, and Fred Smith trail Moore and Perdue by double digits in every possible match. Moore and Perdue both have favorability over 50%. For Moore it's 56/24 and for Perdue it's 58/29. None of the Republicans surpass 40- Bill Graham is at 30/42, Pat McCrory is at 39/38, Bob Orr is at 29/44, and Fred Smith is at 29/47. Frankly those unfavorable ratings seem awfully bad for Republican candidates who aren't even that well known. While I would like to believe these numbers, I think Rasmussen must have interviewed a disproportionate number of Democratic voters and not weighted it sufficiently. Ryan over at the Dome blog has had some interesting posts on what races the Democratic and Republican parties are targeting in the legislature this fall. I'd say Republicans actually have a better chance of taking the Senate this fall than the House, even though they'd have to flip 7 out of 50 (14%) of Senate seats compared to 9 out of 120 (7.5%) of House seats. Looking at the Republican House wish list, three out of five Democratic incumbents on it survived the election in 2004, which was not a particularly good year for their party in the state. With the political climate much better now than it was then, I doubt Alice Graham Underhill, Walter Church, or Jim Harrell is going to lose this year barring some major shift in fortunes. Ray Warren and Ty Harrell, both of whom beat Republican incumbents in 2006, are the other two on the list. Their districts certainly trend GOP but each has done a good job during his first term of not being too offensive to anyone and they would seem to be in good shape as well. It's quite a tribute to Cullie Tarleton, Jimmy Love, and Van Braxton, all of whom flipped their districts in 2006, that they're not even on the top 5 list of Republican targets. Since I don't think the Republicans have much of a chance with their top 5 I sure don't see how they're going to get 8 or 9. I was also glad to see the House Democrats have their own list of seats they're hoping to take. You should always be playing some offense along with a strong defense. Our Texas poll looking at Ron Paul's primary challenge for Congress might have good implications for Walter Jones right here in North Carolina. Paul and Jones are closely tied- Paul has been helping Jones with fundraising. And their challengers, Chris Peden and Joe McLaughlin, are similar too. They're both local elected officials. They're both hammering their opponents on the war and on family values issues. And they're both citing internal polls to show the incumbents are in really big trouble. We called Peden's bluff on the polling with our numbers yesterday. They showed that not only was Paul leading by 33 points overall, but his leads were even greater among voters most concerned about the war (64-27), and moral and family values (65-28). Just as Ron Paul has been representing his district on and off for over three decades, the Jones father/son tandem has been representing eastern North Carolina for decades. Those ties run deep and are bigger than a few unpopular issue stances. My guess is that Jones is in pretty good shape, and the McLaughlin challenge is more noise than anything else. Yesterday Ryan Teague Beckwith wrote a reasonable summary of the polling landscape in North Carolina. None of the polls being run actually poll likely primary voters nor release the sample or weighting given. -Our sample model is based on people who voted in the 2004 or 2006 primaries. We may change that to 2004 primary or 2006 primary or 2006 general if our primary ends up mattering in the Presidential race because turnout in key states has been closer to midterm general election patterns than standard primary patterns. -For Republicans we weight by age and gender. For Democrats we weight by race too but that, um, isn't really necessary for the GOP. Usually too many women and older people respond, so we randomly delete respondents fitting those descriptions so that our poll is as accurate a reflection of the electorate as possible. Mr. Orr can claim all he wants that the polls are all wrong, but I'm confident enough that he's not going to win the GOP nomination based on our numbers that if he does I'll eat a live cockroach. Jay Reiff sent an email out to Richard Moore's supporter list today declaring that 'Bev Perdue got caught again saying one thing, but doing another.' He was referring to Perdue's New York City trip yesterday, and I don't disagree. But Reiff could be accused of doing the same thing he attacked Perdue for in the message. Many public polls do not screen participants to make sure they are interviewing likely Democratic primary voters or that the total poll sample accurately reflects the demographic and geographic makeup of past elections...Many public polls start by lumping both Democrats and Republicans into one poll. By the time they get to Democrats (let alone likely primary voters) the sample size shrinks dramatically and increases the margin of error. It's not that the poll is wrong per se, just not very precise. So what Civitas does is flawed, except when it shows Moore closer than everyone else, in which case its results show the race to be 'clearly wide open.' Just like how Richard Moore says the media shouldn't run the results of automated polls, except when one conducted comes out well for his campaign, in which case an email gets sent out about it to the supporters. It's perfectly normal for campaigns to cherry pick what poll results they tout. It's less normal to issue broadsides throughout the race attacking various polling methodologies and companies. And those criticisms ring pretty hollow when the campaign touts polls conducted using methods it's slammed when the results happen to be better for Moore. It's saying one thing but doing another, and if Jay Reiff thinks it's hypocritical when Perdue does it, I wonder what it is when the Moore campaign does. Paul has been challenged on the right by Peden, a Friendswood City Councilman. Peden has particularly tried to hammer Paul on the war and on issues that fall into the category of moral and family values. But he's not getting much traction with those criticisms. The poll shows Paul leading 64-27 among voters who said the war was their top issue and with a 65-28 advantage among respondents most concerned about moral and family values. Like the Presidential race Paul is very popular with young voters, with whom he has a 75-11 lead. Bev Perdue recently came out with a new video attacking Richard Moore for receiving campaign contributions from people with tony New York addresses. The list of Richard Moore's New York contributors? No, it's actually the list of Perdue's contributors in the Big Apple. And a lot of those addresses sound pretty tony to me. I bet Suite 600 on Park Avenue is a lot nicer than my apartment! This is not the first somewhat hypocritical attack Perdue has made on Moore. Her campaign is making it a habit to try to draw blood on things they're guilty of too. Just one more reason this race has not been a pretty thing to watch. Last month the Civitas folks and I debated some question wording about immigration on their poll. DO YOU AGREE OR DISAGREE WITH THE DECISION BY THE NORTH CAROLINA COMMUNITY COLLEGE SYSTEM TO REQUIRE LOCAL COMMUNITY COLLEGES TO ADMIT 18 YEAR OLD ILLEGAL IMMIGRANTS AND CHARGE THEM OUT-OF-STATE TUITION RATES? The problem with this is that you're giving respondents two reasons to say no. Some people, probably conservatives, might say no because they don't think illegal immigrants should be able to attend local community colleges. Other people, probably liberals, might say no because they don't think the illegal immigrants should be charged out of state tuition rates if they have lived in North Carolina for much of their lives. Civitas set up the question to elicit a specific answer, and they know that. Do you believe illegal immigrants should be allowed to enroll in community colleges and public universities in North Carolina? This time just 25% said yes and 68% said no. Why less support with a more balanced question wording? I think maybe conservatives said yes to the question wording the first time because they thought of the issue as charging out of state tution vs. in state tuition, rather than the issue being admitting illegal immigrants or not admitting illegal immigrants. So I will grant to the Civitas guys that public opinion is probably on their side here. Of course they're still wrong on the issue! This morning I wrote about how I thought the Democratic candidates for Governor were spending way too much time talking about DOT, which does not strike me as a particularly big issue for state voters. There was a little confirmation of that in today's Civitas Poll. Folks were asked to choose from a list of seven issues which they thought the state most needed to deal with. Improving roads and highways finished sixth on the list, with just 7%. Voters are most concerned with health care, improving public education, and job creation. That's an indication the economic stimulus plan Richard Moore is promising to roll out in the next few weeks could help him score more points than what he's been talking about- and that Bev Perdue's constant statement that she wants to make North Carolina 'the healthiest and most well educated' state in the country is in touch with what voters are thinking about. That said, NC voters do think, by a 72-14 margin, that DOT members should not be able to raise political funds. They also think, 58-37, that DOT is not efficiently managing road building and repair in the state. I have no doubt DOT is not that popular or that folks think it should be depoliticized- I just don't think it's going to have much impact on anyone's vote for Governor. Barack Obama leads Hillary Clinton 38-24 in the Civitas Poll. The last North Carolina poll conducted on the race that did not show Obama with a double digit lead was ours three weeks ago. Since then SurveyUSA, Elon, and now Civitas have all shown that lead expanding. I expect we will find the same result next week. Mike Huckabee just needs to drop out. He trails John McCain 50-23, a massive margin shown in the Elon Poll last week as well. The general election match ups for President show wider margins for John McCain than our poll did last week- they show him leading Clinton 48-36 and Obama 46-36. McCain is in almost the same position in our poll, but Civitas shows a lot more undecideds where we showed people moving toward Clinton and Obama. It's a long way to November! This month's Civitas Poll brings the best polling news Richard Moore and Fred Smith have seen in a while. Moore trails Bev Perdue 28-23, while Smith is just one point behind Pat McCrory, 18-17, with Bill Graham at 5% and Bob Orr at 4%. One thing that strikes me as a little odd in these numbers is that the percentage of undecideds in the Democratic race is up to 49% from 42% a month ago in the Civitas Poll, and on the Republican side they've gone from 50% up to 56% in the last month. It's not normal to have the undecideds go up moving closer to an election. But every now and then you just get a sample that's less decisive or paying less attention- we had something like that in our January Democratic tracking poll. One trend this poll indicates that I definitely see emerging in the last ten weeks of the campaign is the Republican contest turning into a two person race between McCrory and Smith as the conservative alternative. I expect that construct will continue to present itself moving forward. It'll be interesting when we do our poll next week to see if we find the same tightening in the two gubernatorial primaries. I have really been amazed at the amount of time Richard Moore and Bev Perdue have spent discussing DOT reform during this race. I just don't think it's an issue that very many voters care about or find particularly resonant. So when I do the monthly tracking poll for the primaries next week I'm going to ask respondents how big of an impact, if any, the issue of DOT reform has on their preferences for Governor. It will be interesting to see the results- I could be completely wrong in my assumption. I'll also do it as a crosstab so we can see whether Moore or Perdue is benefiting more from the issue. On transportation issues, I was amused to see Moore refer to Perdue as a 'very powerful insider' in an interview with WRAL yesterday. What does he think he is? As I've said before, the only Democrat running for Governor who can play the outsider card is Dennis Nielsen. Hillary Clinton has a strong advantage in the heavily white district. Since there isn't much enthusiasm in the district for his Presidential candidacy, it looks like Kucinich made the prudent choice by coming home before the South Carolina primary and campaigning for reelection. While a strong majority of Democrats (59-26) support Kucinich for reelection but Republicans and independents planning to vote in the primary appear to be less enthused with him. He leads 45-35 with the former group and trails 45-34 with the latter. In both the Democratic and Republican primaries for Governor there's one candidate who is not as well known as the others. Dennis Nielsen is not likely to defeat Richard Moore or Bev Perdue, but he's actually been treated with a fair amount of respect. He was invited to participate in the NAACP forum last month, where he impressed some people. When he filed last week, NBC 17 did a story about it. There has been no such respect for Republican Elbie Powers, who is vying with Fred Smith, Bill Graham, Bob Orr, and Pat McCrory for his party's nomination. In fact the morning that filing opened when the News&Observer did a 'by the numbers' look at this year's political races it said there were 4 GOP candidates for Governor, completely neglecting his candidacy! Check out Mr. Powers' website. There's more substantive information there about his views on the issues than you can find on the sites of several of his opponents. I may not agree with all of it but I certainly appreciate his putting it out there. And I hope the news media in our state will treat Mr. Powers with at least as much respect as they are giving Mr. Nielsen. It is dead even in Texas. This race seems likely to come down to whether Obama can wrest enough Hispanic support away from Clinton to earn a victory. He doesn't need to win their vote, but he does need to improve on the 68-27 deficit he's facing right now, which is almost as great as his lead among black voters. Obama has actually taken the lead among white voters in the state, 51-44. As in other states, Obama is actually trailing among Democrats (52-44) but doing very well among Republicans (76-20) and independents (51-40) who plan to vote in the Democratic primary because of John McCain's status as the presumptive nominee. The male and female votes in the state are mirror images of each other. Obama leads men 52-44, Clinton leads women 52-44. PPP will poll the race again next weekend. Even in one of the few remaining southern primaries, Huckabee can't hold his own with McCain. Paul puts up one of his better performances in his home state. State representative Rick Noriega has the lead in the Texas Democratic Senate primary but many voters remain undecided a week out from the primary. Gene Kelly, a perennial candidate for office in Texas who benefits largely from a good name, is in second place. Noriega is doing very well with Hispanic voters, among whom he leads 53-12. With white voters and black voters he has just an eight point advantage, 25-17 and 22-14 respectively. He is strongest with voters whose top issue is the economy, health care, or the war. Noriega needs to get about 45% of the votes of the undecideds to avoid a runoff. Fred Smith doesn't like the way all the independent polls have been coming out so he bought himself one with better results. That's the only conclusion I can make about a new survey the Smith campaign is touting that shows him with 33%, followed by Pat McCrory at 26%, Bill Graham at 10%, and Bob Orr at 6%. -It was conducted by Public Research, a subsidiary of ccAdvertising. That's not exactly, you know, Gallup. I've never heard of it before. -Even stranger though, 6,380 people were surveyed. That is quite abnormal and often a huge sample size is an indicator of a push poll. I'd guess the survey design on this one was quite interesting. My advice to the Smith campaign: spend your money on television instead of phony polls and then maybe your standing will start to rise for real. Or at least make the results a little more believable- when you're down by 5 to 15 in all the other polls making it a tie would be more realistic than giving yourself a seven point lead. Momentum is rapidly swinging Barack Obama's way in Ohio. Even just a couple weeks ago Clinton held a lead over 20 points in some polls. Obama is benefiting from the decided nature of the Republican contest. That's increasing the number of Republicans and independents who plan to cast their ballots in the Democratic primary next week, and Obama leads those groups 80-13 and 64-33 respectively. Clinton actually has a 56-40 edge among self identified Democrats. One anomaly in Ohio is that Clinton actually has a 50-48 lead among voters 18-29, bucking the trend of strong Obama performances with that demographic. The Ohio Poll released by the University of Cincinnati earlier today also showed the candidates statistically tied in that age group. Obama's strength is coming from a 55-40 lead with voters 30-45, while Clinton leads 65-31 with senior citizens. The standard racial and gender disparities seen in many states also apply in Ohio. Clinton leads 56-38 with whites while Obama has a 76-24 lead with African Americans. Clinton has a 55-42 edge with women, but Obama holds a 51-45 advantage with men. Time is on Obama's side now. If he continues to make these gains on Clinton in the state over the next week, he seems likely to emerge as the victor in Ohio. Not much to say here. If Huckabee thought he was going to hold off McCain by doing well in Ohio he was wrong. The Associated Press has a policy of not citing automated polls. It's a silly, backwards rule with companies that use IVR showing more and more by the year that they're just as or more accurate than traditional live interviewers. But that's their right and it's not anything that the main political writer for the AP in North Carolina, Gary Robertson, is responsible for. Robertson is responsible, though, for misleading stories like this. The Elon Poll said that a third of North Carolina voters are undecided in the Governor's race so Robertson wrote a lengthy story about it, basically citing it as fact without any evidence to the contrary. PPP's most recent poll showed only 20% of likely voters undecided in the Democratic primary. Survey USA, which has had the most accurate numbers of any company in the country for the Presidential primaries, showed 22% undecided. The Elon poll is great for gauging where public opinion in North Carolina is about various political issues, but because of the way it screens for likely voters (it doesn't), it's not a reliable barometer for election results. And I don't think they would claim that as their role- that's what companies like PPP and SUSA specialize in both in North Carolina and at the national level. Yet Robertson wrote an entire story about the Governor's race relying on one poll that probably is not a great indicator for what's going to happen in May. He is on our media distribution list, so it's not like he doesn't know what the other polls are saying. It's not Robertson's fault that he can't cover the polls of most companies regularly talking to North Carolina voters. But it is his fault if he writes lengthy feature stories trumpeting one poll that is showing significantly different results from companies that specialize in election polling without granting that the individual poll may be an outlier. Robertson didn't even mention in the story that the margins of error on the polls for the Governor's race were abnormally high for a publicly released poll. I don't think writers should extrapolate entire stories about political races based on any individual poll, including ours. But they certainly shouldn't do it for polls that don't attempt to get a sample representative of what the primary electorate will be and let respondents skip back and forth between parties within the poll either. It results in a misleading story, and that's a disservice to the small papers across the state that rely on the AP for their state political coverage. The column du jour for the Capital Press Corps this week seems to be the one about how Richard Moore is in big trouble. Scott Mooneyham wrote it earlier this week and Rob Christensen chimed in today. -Moore is not going to win this race by making voters like him more than Bev Perdue. To some extent spending money touting his accomplishments or his issues is just going to result in more treading water, unless he can roll out some message about his record that's more compelling than what he's put forth so far. -None of the attacks Moore has levied against Perdue over the last year through earned media and the internet have really taken hold. They've all been too insider baseball. For as much nastiness as there's been between the two candidates in this race the only attack I really think has been effective was Perdue's campaign holding the Parton fiasco against Moore. It was a real issue in the news all over the state that non-political junkies knew about. Her lead in our poll jumped from 9 to 16 the month after that played itself out in the press and her average lead between the most recent Elon, Civitas, PPP, and Survey USA polls has now gone up to 14 where it had been aroudn 9-10 previously. So how does Moore win? Draw blood, and a lot of it over the last ten weeks. I would be shocked if he doesn't go on the air with negative ads in the next few weeks. But if all he has on her is stuff that the campaign has already rolled out I don't think that's going to work because none of it is going to resonate enough with low or mid information voters. The ads need to take on some new lines of attack that focus on things that would actually make a significant mass of voters think less of Bev Perdue and they need to be understandable to folks beyond the political junkies. Blasting the Department of Transportation and blaming it on Perdue just isn't going to do it with too many voters I don't think. It'll be interesting to see if the Moore campaign has some new tricks up its sleeves to tar Perdue with- if it doesn't it's hard to see this race turning around. Elon has its new poll out- I think it is even more flawed than usual, but the results generally make sense. What's wrong with it? Incredibly small sample sizes for one thing. No professional polling company would ever release a survey for the Republican Governor's race that included just 233 respondents. All of their results for election matches have much higher margins of error than anything we (or most outfits) would ever release. They also said they only weighted for gender. My guess would be that means racial minorities and young people are probably seriously under represented in the poll. I tend to think that is about right, maybe a little charitable to Obama. We had Obama up two points two weeks ago but I am sure that has expanded as the race has moved his way nationally. I doubt that it is really this lopsided. I think that's a function of not polling likely primary voters. I think the margin is probably correct or at least in the ballpark. The percentage of undecideds is too high but that's a function of polling people who will not vote in the primary and haven't given the race any thought. I don't think McCrory is really up by that much but the order seems about correct. You can see the full poll here. I don't mean to be too tough on Elon, I'm sure doing the poll is a good learning experience for the students. But I think they're fully capable of producing a much better poll. -Incumbents facing primary challenges so far include Clark Jenkins, David Weinstein, Ellie Kinnaird, Bill Purcell, Katie Dorsett, and Fletcher Hartsell. Kinnaird and Dorsett's opponents are both County Commissioners, Moses Carey and Bruce Davis. Carey raised five times more money than Kinnaird in the last half of 2007 and will probably benefit from Orange County putting a transfer tax referendum on the May ballot, as that will increase turnout from more conservative Democrats in the northern part of the county who could be inclined to support him against the liberal Kinnaird. That said, the six term incumbent is certainly the favorite. Jenkins is being challenged for the third time in a row by Shelly Willingham. He forced him into a runoff four years ago, but he defeated him solidly in 2006. I don't know anything about the challengers to Weinstein, Purcell, or Hartsell. -Some seats being vacated by incumbents have drawn a crowd. Others have not. Charlotte City Councilman Andy Dulin is running as a Republican to replace Robert Pittenger. Former legislator Bob Rucho is supposed to be running as well but has not filed yet. For Kay Hagan's seat only former Greensboro Councilman Don Vaughan, a Democrat, has filed thus far. Already five Democrats have filed to replace John Kerr in the Senate. Former Wake County commissioner Jack Nichols and Josh Stein, director of the Consumer Protection Division of the Attorney General's office are running as Democrats to succeed Janet Cowell as she runs for Treasurer. Three people I don't know anything about yet are seeking Fred Smith's seat. -Two Republican house members are looking to move up to the senate. Whoever emerges from the crowded Democratic primary in John Kerr's district will have to face Louis Pate. Debbie Clary is trying to turn Walter Dalton's seat red. -Three Democrats who took over Republican held seats in 2006 will have to fight to keep their positions. Joe Sam Queen will face Keith Presnell for the third time in a row. Presnell won in 2004, Queen was victorious in 2006. Tony Foriest will face Rick Gunn, who has served in a variety of civic leadership positions though not elected office in Burlington. Steve Goss will face off against Jerry Butler, a Boone dentist who like Gunn has been involved in the community but not public office. -Finally, two interesting developments in the Triangle. Floyd McKissick, who was appointed to fill the late Jeanne Lucas' seat after a contentious appointment process, somewhat surprisingly does not yet have any challengers in the primary. And in Wake County, Democrat Chris Mintz will face Republican incumbent Neal Hunt. Hunt won just 57-43 two years ago against a poorly funded Democratic opponent who was making her third unsuccessful legislative run in four cycles. Money will not be a problem for Mintz, and that makes this one of the best opportunities for a Democratic pick up on the senate side. If I've missed anything or gotten anything wrong, please let me know in the comments. I'll revisit this when filing is concluded. Two years ago when I was writing a weekly column for a local newspaper I talked about the lack of big picture coverage of the North Carolina legislative races. Each individual paper wrote about its local races, but even the McClatchy big boys never really wrote anything looking at competitive races across the state and how they could tip the balance of power in Raleigh. -Incumbent House members facing primary challenges so far include Annie Mobley, Angela Bryant, Edith Warren, George Cleveland, Robert Grady, William Brisson, Joe Boylan, Laura Wiley, Kenny Furr, Curtis Blackwood, Fred Steen, Harold Brubaker, Jeff Barnhart, Karen Ray, Tricia Cotham, Jim Gulley, and Phil Haire. Mobley, Bryant, Furr, and Cotham are all running for their seats for the first time after being appointed to vacancies. Brisson and Boylan themselves got elected by defeating incumbents in the primary in 2006. Now they're the targets. I know Cleveland is being challenged by an Onslow County Commissioner and Wiley's opponent sounds viable too. Mark Binker had some good background on that. Beyond that I don't know much about whether these incumbents are really in risk. -The two Republican seats most likely to flip this fall have strong Democratic candidates and no Republican filed yet. In the 116th District Charles Thomas won by just 420 votes in 2006 and is now leaving the seat. Jane Whilden, who has been the director of the Governor's western office and has good political connections throughout the district and the state, is a formidable candidate on the Democratic side. In the 25th District, being vacated because of Bill Daughtridge's run for Treasurer, Democrats Carnell Taylor and Randy Stewart have filed. Stewart is a former Nash County commissioner and Taylor was the Democratic candidate two years ago. It seems inconceivable that there will not be Republican candidates for these seats but Democrats certainly seem to be in good shape in both cases. -There are plenty of rematches on the docket. Republican Mark Hollo is trying to get back the seat he lost to Democrat Ray Warren two years ago. In the Triangle Democratic challenger Ed Ridpath, who had a surprisingly strong performance in 2006 and has just kept on running, is giving it another shot against Paul Stam. Further west Democrat Chuck Aldridge, who held Republican Mitch Gillespie to 54% last time out is trying again. In a neighboring district the scenario is reversed as Democratic incumbent Walter Church will have to fend off another challenge from Republican Hugh Blackwell, who he bested by three points the last time out. -What of the other districts that flipped parties the last time around? So far Democrats Van Braxton, Jimmy Love, and Cullie Tarleton are without challengers. Ray Warren, as mentioned above, has another challenge from the guy he beat last time. And in the Triangle, Democrat Ty Harrell will face Apex commissioner Bryan Gossage. Gossage won't have the baggage of Russell Capps, who previously held the seat. But he won't have the name recognition either, and Harrell has done a pretty solid job. His road to reelection won't be as easy as Grier Martin's was two years ago after defeating a Republican incumbent, but if he runs the same strong grassroots campaign he did the first time around he's the definite favorite barring a disaster at the top of the ticket. I'll write another one of these after filing ends but that's the picture for now. If I've missed anything or gotten anything wrong please let me know in the comments. No surprise that when filing yesterday Pat McCrory introduced a pledge for a positive campaign. McCrory has the highest name recognition, plenty of money, and a solid lead in the polls already over his Republican rivals. If the primary campaign is a ho hum positive affair, it will be very hard for any of his opponents to over take him. It's a nice try by the front runner but I think his opponents know that if they stay positive, they're toast. Pat McCrory has been putting up impressive performances in the Charlotte region in our general election tracking polls. He has 53% against Richard Moore and 59% against Bev Perdue. I realized that for McCrory to be performing that well in the region, he had to be getting a significant amount of crossover support from Democrats in the area. So I ran the numbers. Keep in mind this is a very small sample- just 42 of those polled were self identified Democrats in the greater Charlotte region. But the result is still stunning. Moore and Perdue both lead McCrory just 43-40 with 17% undecided among voters of their own party in that area. A lot of Democratic observers were irritated around the time McCrory was making his announcement at comments from Democratic Charlotte City Council members to the effect that McCrory as Governor would be a good thing for Charlotte. Clearly their attitudes are shared by a good number of their constituents as well. Loyalty to Charlotte appears to be greater than loyalty to the Democratic party for these voters. If McCrory wins the GOP nomination I would strongly encourage Moore or Perdue to spend some money, even early in the general election contest, telling Democrats particularly in Mecklenburg County just how conservative McCrory is on many issues. Don't let them get solidly committed to him. Serving as Governor brings a whole different set of issues to the table from being Mayor, and folks who have liked him as the city's chief executive might be less enamored of his views on some key statewide issues. Keep in mind also that while Perdue and Moore have been on tv in most of the state, they are not in Charlotte. So these numbers among Democrats in the region should shift some when they start running ads in that area. Towns said automated dialing is unreliable and generally distrusted in political circles. "A 12-year-old kid could pick up the phone and push the buttons," he said. "It provides interesting tidbits for political junkies, but little else." I guess those 12 year olds must be pretty representative of the population at large this year. Survey USA, which uses IVR, has had the most accurate polling of any company in the country that has done more than ten of the primary races. PPP is 4th out of 9 in that category and Rasmussen, which also uses IVR, is 5th. Live interviewer mainstays Zogby and Mason Dixon lag behind the leading IVR companies. That said if Mr. Towns, a former Republican congressional staffer, would like to advise folks in his party to utilize considerably more expensive polling techniques that aren't any more accurate than what we do, this Democratic pollster says make my day. It's just not very fiscally conservative! The Daily Tar Heel had a good story today about how high turnout from young people will be the key if Barack Obama or Hillary Clinton is able to win the state this fall. Our poll this week showed McCain leading three out of four age groups against either of them. But with the 18-29 demographic Obama leads 59-30 and Clinton leads 55-35. That's an indication the news from the state Board of Elections about thousands of new registrants this year already is a good sign for Democrats. It's not going to be good enough to get all the students at UNC-Chapel Hill registered this year. Young retail workers in Cabarrus County and folks working construction in Brunswick County need to sign up and turn out too. If enough of them do, we could be in for a big surprise this fall. Our friends at Survey USA devote a lot of energy to showing how pollsters stack up against each other through various ways of measuring the error. PPP had the best poll for the Democratic primary in Wisconsin last night by all eight standard ways of measuring poll accuracy. Check out the analysis here. PPP has now done polls for the Democratic primary in five states, and we beat all of our competitors in both Wisconsin and South Carolina. Not bad for a company doing the Presidential race for the first time. We've made mistakes and will surely make more entering onto the national scene but we're learning from them and will hopefully continue to improve. Pat McCrory has gone largely unscathed by his Republican opponents in the last month while Bev Perdue and Richard Moore have beaten each other up. The result is McCrory tying the Democratic front runners in the polls after trailing last month. McCrory particularly benefits from strong support by independent voters. He leads Moore 47-28 and Perdue 48-32 with that group. He also gets stronger cross over support from Democrats than his fellow Republican candidates. While they earn 8-13% of the vote from self identified Democratic voters, McCrory gets 18-20%. It is a virtual certainty that the Democratic nominee will emerge from the primary somewhat wounded after a bitter contest. It will be interesting to see whether Fred Smith and/or Bill Graham start spending their money soon to attack McCrory in the same way. That could be a significant determiner in who enters the general election contest as the favorite. The poll also shows that, whether they like her or hate her, voters have a stronger opinion about Bev Perdue than they do about Richard Moore. In a contest between Graham and Moore 29% of voters are undecided while just 18% haven't made up their mind if it's Graham and Perdue. Against Orr that figure is 31% for Moore and 21% for Perdue, and versus Smith the numbers are 30% for Moore and 22% for Perdue. Perdue's closer to 50%, but Moore has more room to climb. Elizabeth Dole's approval rating continues to languish in the low 40s but it's not moving much support into the columns of either of her two main Democratic opponents. Hagan and Neal both have a lot of work to do still within their own party. Hagan has the support of 54% of Democrats right now, Neal the support of just 51%. Either of them would need to do well with independents to knock off Dole and there's a lot of room for improvement there as well- Hagan trails 46-27 with that group while Neal is behind 46-23. They're also both polling below 50% with the key Democratic constituency of African American voters. Dole's approval rating is surprisingly low but Hagan and Neal have a long way to go to convince voters they're a better alternative. These poll results are good news for Democrats on several levels. First, they represent significant improvement from a similar poll last month, especially for Barack Obama. Last month Obama trailed McCain by 14 points. Now that's down to five. Huckabee led Obama by eight last month and now trails by one. That represents a nine point gain for Obama on both fronts. Second, although they probably wouldn't say it publicly, most Democrats in the state would be pretty happy to only lose the Presidential race by five points. Double digit losses have become the rule rather than the exception of late. If the Democratic nominee loses by only a small margin Republican hopes to regain the legislature or the Governor's mansion are likely to be pretty futile, and it greatly increases Democratic hopes of winning back offices like the 8th District Congressional seat and the Labor, Agriculture, and Auditor positions. Certainly Democrats in the state will do what they can to turn North Carolina to the blue column in the Presidential race. But I bet they could live with these results too. Clinton and Obama both lead McCain by large margins among young people but trail with the rest of the age groups. A large turnout from new, young voters would likely be the key if the Democratic nominee is going to win the state. Last week I talked to WCHL about how Bev Perdue was expanding her lead on Richard Moore in the places where they're both on tv. You can listen to the story here. Meg Martin asked me why I thought Perdue's ads were more effective. I said that at this point early in the campaign one of your main goals has to be to get voters to like you. With the Presidential race drowning everything else out and the candidates for Governor not that well known, a key objective is to raise positive name recognition rather than necessarily lay out your whole platform this far before the election. Perdue's biographical ads seem to have done an effective job of showing her life story in a way that connects with viewers. As I thought about it over the weekend, I think there might be something else at play too. Barack Obama is the political phenom of 2008. He's talking about change. But he's talking about change in a way that sounds positive rather than negative. Richard Moore, particularly in his ad deriding boards and studies, is also talking about change. But his tone is a downer, and that might not be the right note to strike in the year of Obama. When he comes back on the air it will be interesting to see if he shifts his tone to be more Obama-esque when projecting a message of change. Obama has expanded his lead in Wisconsin since the survey PPP did a week ago. PPP projects that if the Wisconsin primary had a standard turnout, Obama would lead just 47-44. But assuming the disproportionately high turnout of blacks and young people that other early primary states have experienced occurs in Wisconsin as well, that should be worth an extra ten points of margin for Obama. One trend continuing from last week's poll is that many more Wisconsin Democrats list the war as their top issue than in other states. That's a big part of Obama's success, as he leads 58-37 with that constituency. As has happened in recent primaries in places like Virginia, Tennessee, and Georgia Huckabee is closing in on McCain as election day gets closer. McCain's 11 point lead is down from 21 points in a poll conducted last week. One thing Wisconsin has in common with other states where the primary has broken Huckabee's way in the closing days is a high percentage of Republican voters who say that moral and family values is the issue they take into account most when deciding who to vote for. It's the second biggest issue in the state for GOP voters, right behind the economy, and Huckabee leads 70-18 with people who say it's their top concern. The Republican race for the nomination is at a similar point to where the Democrats were four years ago when they came to Wisconsin. The race is all but over, but not all of the viable challengers have dropped out. That year John Edwards came surprisingly close to beating John Kerry in the state, and if the race continues to move in the direction it's been heading Huckabee could put a scare into McCain tomorrow night. We'll have our monthly poll looking at the potential general election match ups for Governor, President, and Senate. I'll be most interested in the Presidential matches. Last month Hillary Clinton did considerably better than Barack Obama in potential matches against John McCain and Mike Huckabee, the remaining Republicans in the race. McCain led Clinton 49-42, while holding a 52-38 margin on Obama. Clinton led Huckabee 46-44, but Obama trailed him 49-41. The crux of the problem for Obama in those polls was the Democratic vote. Obama got more support from Republicans than Clinton, but while Clinton got the support of 72-75% of respondents who identified themselves as Democrats Obama got just 59-66%. I think Obama has made major strides in the hearts and minds of Democratic voters across the country since last month, so it'll be interesting to see if he's doing better this time around. In the gubernatorial races, it will be interesting to see if the gains Bev Perdue has been making in primary polling extend to the general election match ups, where Richard Moore was the stronger candidate last month. I'll also be watching to see if any Republican other than Pat McCrory is gaining ground on the Democratic front runners- I doubt it. On the Senate race the big question is whether Kay Hagan and/or Jim Neal will be able to hold Elizabeth Dole below 50% this month. If all goes well we'll have the President and Senate numbers Tuesday and the Governor numbers Wednesday. Bad news for Walter Jones? I'm sure Walter Jones watched with interest on Tuesday night as Wayne Gilchrest, a nine term Republican congressman from Maryland, lost in the primary to state senator Andy Harris. Harris effectively attacked Gilchrest as too liberal, especially harping on his views about Iraq that diverged from the party line. Sounds pretty similar to the situation in our 3rd District, where Jones is being challenged on the right by former Onslow County commissioner Joe McLaughlin. There is, of course, a very key difference. Through December 31st, about five months before the election, McLaughlin had raised a little over 70k. Five months before his election, Harris had raised well over half a million dollars. But the folks on the far right have seen now that they can knock off a moderate Republican Congressman in the primary with the right candidate and the right amount of money. They'll doubtless move on to the next target, and it could be Jones. If McLaughlin starts to see money flow in across the country from ultra conservatives bent on revenge, the race in the 3rd District could get very interesting. And of course we'll be happy to poll it if someone pays us to! An admitted Richard Moore supporter is basically accusing PPP of being in the tank for Bev Perdue over on the Under the Dome blog. The only evidence that has been presented for this assertion, made several times by people associated with their campaign now, is that our former Communication Director now works on the Perdue campaign and that our analysis of polls tends to be more favorable to Perdue than Moore. This Governor's race is a great example of how silly the former assertion is. Four years ago Mac McCorkle and Jay Reiff worked closely together to reelect Mike Easley. Now they're working for two campaigns that seem to pretty much hate each other. They went in total opposite directions in this race. Just because someone who used to work here is for Perdue doesn't mean that Dean or I am. To be quite honest, if the primary was today, I would not be able to bring myself to vote for either Moore or Perdue because I've been so disgusted by the tenor of their campaigns. I'd either write in Roy Cooper, who I wish had run this year, or Jim Hunt, who we could always use eight more years of! On the latter accusation the cold hard reality is that Richard Moore is getting beat pretty bad in everyone's polls. So when I analyze them in various ways, it's going to tend to be more positive for Perdue. The big winner here is Richard Moore. Not only does he now lead all four Republicans after trailing Bill Graham and Pat McCrory last month, but he also leads most of them by a greater margin than Bev Perdue does. That's what I wrote after we released our general election match up poll for Governor last month. Moore was doing better than Perdue, and that's what I said. That quote was picked up by the N&O. And if he starts doing better in polls for the primary, I'll talk about that as well. If there is something missing in the way I am analyzing polls, trends being shown by some subset of the electorate that would benefit Moore, people should feel free to e-mail and tell me that and if it's something compelling I'll blog about it. The bottom line is that it is note worthy that Perdue is making greater strides in places where tv has been running than Moore is. It is note worthy that increased black and female turnout would appear to benefit Perdue. But if I am missing note worthy things that would be good for Moore, I want you to let me know so that I can write about it. It gets on my nerves when people question our integrity, but we're just going to plow forward giving our opinions about the way the Governor's race is going, releasing the numbers the way they come out and telling people what we think it all means. We'll do it in a fair and even handed fashion, just like we have been since the outset. -The conventional wisdom has been that McCrory would have trouble with conservatives in his party, but in this poll he actually has an even wider lead with them than he does with moderates. He leads Smith 33-18 with folks who described themselves as conservatives and has a smaller 32-19 lead over Graham with moderates. I think McCrory could still have trouble with conservatives but only if Graham and/or Smith run a bunch of ads trying to project him as a liberal. Whether they do that, and how effective it is, could determine the nominee. My guess is that McCrory will win without a runoff unless his opponents aggressively spend money attacking him. -That said, McCrory is still lagging behind in the parts of the state outside Charlotte. In eastern North Carolina Smith leads with 23%, followed by Graham at 20% and McCrory at 12%. In the combined Triangle and Triad, Graham has the advantage with 21%, followed by Smith at at 18% and McCrory at 16. But McCrory blows them all out of the water in Charlotte and WNC with 61%, the next closest being Smith at 11%. The full results from this poll are here. PPP gets a lot of flack for doing automated polls, but one positive benefit to them is that we always say the candidates' names right! Such can not be said for two live interview polls I was called for recently. One repeatedly asked me questions about a statewide candidate but said her last name wrong. Another referred to a candidate alternately by three different first names. When interviewers don't get the people they're talking about’s names right it can be hard to get accurate results. Another recent doozy was someone called me asking my thoughts about a different statewide candidate. I made some nice comments and the woman interviewing me said, "yeah, a lot of people have been saying nice things about him tonight!" That's not exactly professional for an interviewer. There is nothing wrong with live interview polling, but you need to make sure you're hiring the right people to do it. With the current glut of races it's hard to always hire the best call center. Say what you want about PPP, but at least we get your name right! Earlier this week I analyzed what effect tv ads were having on the Governors race. For the last month Richard Moore and Bev Perdue have been on the air in every market in the state except Charlotte and Asheville, where advertising is less cost effective because you're talking to a lot of people in South Carolina. PPP broke down the results of our January poll before tv advertising began and our February poll to see how the candidates' standing has shifted since they went on the air. Although Perdue's overall lead in the state went from 16 points to 14 from January to February in our poll, her standing in the regions where tv ads have been running has improved from 43-28 to 48-30. Survey USA has also conducted polls in the state before and after the candidates went on the air. Their January poll showed Perdue with a nine point lead and their February poll showed a 20 point lead. Separating out the places where tv has been running the difference is even more dramatic. In January, before tv ads, Perdue led those parts of the state 48-36 in their survey. In the month since the candidates went on the air she now leads those areas 54-30. These two independent polls seem to indicate Perdue getting a lot more traction with her media campaign. Elbie Powers paid his $1,359 and filed for Governor on Monday but he still hasn't gotten much love from the media, with the exception of a few lines in an AP story. I'll tell you one thing. He certainly has the most down to earth solutions for our problems. After I wrote on Saturday about how I might vote for him if he won the GOP nomination and had a feasible plan for reducing my $400+ annual milk bill, he didn't propose a commission to study the issue or pass it off to a staff member to deal with. He e-mailed and told me he'd be happy to sell me a cow. The zoning restrictions in Chapel Hill are a little stingy so I think I'm going to have to take a pass but I certainly appreciated the initiative Mr. Powers showed. I may be a Democrat but Bev Perdue and Richard Moore have not offered to sell me a cow. If I, Elbie Powers am elected next Governor of NC., this will be a turning point in history of NC and the United States for a new direction for taxpayers, small business owners. My common sense will lead us to lower taxes, lowering cost in many areas, cutting taxes, doing away with some tax load. Our state's economic engine will turn for the benefit of working people as never before, supporting our state in ways unheard of that will work to our benefit. All while lowering your taxes. We are about to keep a few corporate profits here for our relief. If an individual has an employee who is secret in spending their money, increasing their cost, we fire them. Ladies and Gentlemen, politicians are our employees. They over spend, unwisely spend, make it a law where we can't see their retirement, with what appears as little or no regard to accountability. Big question - How do we raise money for our $20 billion dollar annual budget, growing each year more and more, without burden to taxpayers. Answer is simple – Common Sense business approach!! Of the $20 Billion annual budget what percent is wasteful spending? 2, 5, 10, percent? we have just cut our budget this percent with the right leadership. My very conservative estimate is 10 percent. This is certainly the best polling news Jim Neal has received yet over the course of the race. Still, Survey USA's numbers have been all over the place on this one. When they polled it in November, Hagan led 39-31, so 70% of respondents supported one of the two main candidates. Last month Hagan led 37-29, so that number was down to 66%. Now only 47% of respondents support one of the two candidates? Elections rarely go from 70% supporting one of the front runners six months out to only 47% supporting one of them three months out and I don't think the real reason is a surge in support for Howard Staley. I explained last month why Survey USA's numbers sometimes come out different from ours and I think this is one case where our numbers are showing the more accurate picture. These numbers also continue to show an anomaly when broken down by ideology. Neal is running as a fiery progressive while Hagan is running as, well, I'm not really sure what her message is. Despite that, self identified liberals support Hagan 29-16, while moderates support Neal 28-25 and conservatives support him 29-20. Those crosstabs don't make a ton of sense given the general thrust of the race. Perhaps the Moore campaign should have put out a press release touting our results last week showing him down by 14 because our numbers on the race are down right charitable compared to Survey USA. McCrory and Graham are each doing a lot better than our poll last week showed, Smith is doing a lot worse. I saw these numbers on WTVD's website where the crosstabs haven't been posted yet so I'll analyze this more once those are available. They project 34% of the primary electorate to be black which would be well out of the ordinary but certainly conceivable in this election year. Their crosstabs show pretty much the same trends our poll last week did- a significant racial gap, Obama winning all but the oldest age group, Obama having a smaller margin with Democrats but a much larger one with unaffiliated voters. Don't really have anything to say about this one. We're not likely to matter once our primary comes around. No results for any of the other statewide races from Survey USA today but sometimes they release polls over a couple days. Perhaps we will get new numbers for Governor from them tomorrow. I've been fascinated with the fascination the last few days about who John Edwards might endorse for President. I think an Edwards endorsement would have zero impact. If there is one office for which voters are fully capable of making up their own minds without any external help it is President. I think the value of endorsements is at its greatest in low interest races and decreases right up the line to about nil for President. When I was running school board campaigns as a teenager in Ann Arbor, one of my jobs was to round up as many great names for my candidates' signature ads that ran in the paper the day before the election as possible. No one pays attention to school board contests so having the endorsement of a Democratic legislator in a nonpartisan race could really move some votes in the absence of other easily digestible information. But President? No way. Unfortunately John Edwards did not have that many supporters to begin with, and the ones he had are by and large going to make up their own minds about who to support now that he's out. If one hundredth of one percent of the primary electorate was influenced by an Edwards endorsement I'd be surprised. I agree with Edwards' campaign manager, David Bonior. Better to sit this one out and remain above the fray. In most states the number of people listing the war as their top issue is declining rapidly. But in Wisconsin it's still a big thing for Democratic voters, and that's helping to vault Barack Obama into a solid lead. Obama has a 55-34 lead among respondents who said the war was their biggest issue while actually trailing Clinton 47-45 with people most concerned about the economy. Wisconsin appears to be one state where folks are still taking into account Clinton's vote on the war five years ago. Obama is also doing a solid job cutting across racial and gender lines in Wisconsin. He has his customary large advantage with black voters, 66-24. But he also leads Clinton with whites, 49-41. He leads 56-35 with men and 46-43 with women. Obama actually barely leads Clinton among self identified Democrats, 46-44. But there are a lot of independent voters in Wisconsin, who can vote in the state's open primary, and Obama's lead with that group is 63-25. Mike Huckabee may be gaining some momentum on John McCain in a lot of states but Wisconsin doesn't appear to be one of them. While Mitt Romney was in the race, McCain's Achilles heel was voters who listed immigration as their top issue but with him out of the running McCain even leads among those voters, 41-33 over Huckabee. McCain also leads Huckabee 64-22 and 64-25 on key issues of the war and the economy respectively. PPP did polls in the Presidential primaries for our neighboring states of South Carolina, Georgia, and Tennessee. Comparing the exit polls and our surveys, on average 7% more of the Democratic primary electorate in those states was black than usual, and the electorate was also 4% more female. PPP always weights the results of its primary polls to reflect an approximately 58% female and 26% black North Carolina Democratic primary electorate but we will have to re-evaluate that as it becomes more clear whether we will join the Presidential circus. So although there are some small shifts, that particular electorate wouldn't make a huge difference in the results. First things first for this Monday morning. Anyone who has a vote for national player of the year and saw the play in double overtime when Tyler Hansbrough by sheer will picked the ball from a Clemson player, dove for it on the floor, got fouled, and swished two free throws to make it a two possession game and does not vote that boy national player of the year should have their vote taken away. Now that I'm done disenfranchising stupid sports reporters, on to the North Carolina race for Governor. Richard Moore and Bev Perdue both went on the air about a month ago. They're running ads in every tv market except Charlotte and Asheville, in both of which you get less bang for your buck because you're talking to a bunch of people in South Carolina. Those markets will no doubt be blessed with campaign ads soon enough. Someone suggested to me it would make for an interesting post to run the numbers and see the difference in the Governors race between last month and this month just in the parts of the state where ads have been running, to see if those are giving any candidate a discernible advantage. Bev Perdue had a 16 point lead overall in our poll last month, and this month it's down to 14 points. But she's actually improved her standing in the parts of the state where ads have been running. Last month, before anyone went on the air, she led those areas 43-28. Now she has a 48-30 advantage. It's not a big difference but it shows she might be getting a little more traction with her ads. We'll have to see it across a couple months to really make any conclusions. Last week the Moore campaign threw the Perdue camp a softball. And the frontrunners just watched it fly by. Richard Moore is running an ad trying to project himself as an outsider, railing on studies and commissions in Raleigh as wasteful and ineffective. The only candidate in this race who has any credibility running against the Raleigh establishment is Dennis Nielsen, but that's not my point. The Moore campaign responded to the response by touting Moore's work with a statewide commission on domestic violence. So the Moore campaign, running an ad ripping commissions, is in the same breath touting Moore's accomplishments with a commission. That's called talking out of both sides of your mouth. It's like last month when the Perdue campaign ripped Moore for taking money from DOT members when it had actually taken three times more of that money. It's now been almost 72 hours since the Moore campaign issued this contradictory response, and not a peep from the Perdue campaign calling them out for the hypocrisy of it. Gary Peace has criticized Bev Perdue for not being aggressive enough against Moore and this is a good example of it. Perdue may be leading the polls but the election's a good three months away and not swinging away on something as easy as this is like taking a called strike on a fat pitch down the middle. I was kind of surprised this week that when Republican gubernatorial candidate Elbie Powers sent a lengthy email to the media (and me) announcing that he would file on Monday and what issues he would be running on, it went virtually ignored. I assume it's because the press doesn't view Powers as a viable candidate but he's only running five points behind Bob Orr in the polls and the Capital Press Corps seems to treat his every word as the gospel. When Powers first announced he would run last year he showed an ability for self deprecation that the rest of his opponents of both parties have sorely lacked by declaring that he was 'the first politician who will admit he's straight out of the nut house.' Powers, of course, is a pecan farmer. 1. Creating minimum of 1,000 jobs per county. Expect this number to go higher. MUCH HIGHER!!! 2. Dropping the price of automobile gas to consumers, diesel to farmers and consumers, aviation fuel to commercial carriers in the state. 3. Lowering cost of many everyday items to consumers, i.e. Milk, Eggs, Bread, Coffee, Beef, Insurance, and many more. Keeping more of your hard earned money in your pocket. This teetotaler spends over $400 a year on milk. So if Mr. Powers wins the Republican primary and can produce a viable plan for how he's going to cut down on my annual milk bill, maybe I'll vote for my first ever Republican. I'll be especially impressed if he can outline how he's going to create 1,000 new jobs in places like Hyde and Tyrrell Counties. Update: Rob Christensen wrote his weekly column about this and properly cited us in using our numbers- his column is not what I'm referring to below. -Several polls, most recently the one Rasmussen did for WRAL last week, have shown that Perdue is better known to the state's voters than Moore. If a bunch of extra people turn out primarily because of the Presidential race who have not been following the rest of the stuff on the ballot they're most likely to vote for the candidate they know, and more likely than not Perdue will have the edge there. -The group most likely to have disproportionately high voter turnout if the Presidential race matters is African American voters. Barack Obama has been bringing out record black turnouts in several of our neighboring states. Bev Perdue has consistently done better with African Americans than Richard Moore. Her leads on him in the last three polls have been 56-19, 46-18, and 45-21. That's a pretty strong trend. -If women turn out to vote for Hillary, once again Perdue (and also Kay Hagan) will benefit. Perdue has led 46-29, 40-23, and 42-28 among women in our last three polls. It's not as strong as the advantage she has with black voters but it is still likely to do her some good at the polls. One point the reporter made in his story was somewhat flawed. He suggested there might be an increase in turnout from unaffiliated voters and said that could benefit Richard Moore. It's true that Moore led Perdue 40-37 with that group in this month's poll. But Perdue led that group 37-20 in the poll last month. With crosstabs, trends across months are much more meaningful than what came out of the most recent poll. There were 66 unaffiliated voters in the sample for this month's poll. That's a margin of error of +/- 12% on that particular crosstab. Moore may be the more popular candidate with independent voters, but we don't have any meaningful data yet to show that. It doesn't compare with the consistent double digit leads Perdue has shown among female and black voters. If I was on the Moore campaign I would be hoping for one of the Presidential candidates to start running away with it sooner than later. Increased voter turnout is probably going to be a bonus for Perdue. Still no real movement in this race, although Smathers is consistently near the top. Besse's performance is his best since last April. The Cowell and Young numbers are identical to last month. Weisel has improved by a couple points. Atkinson increased her lead every month after we started polling this race in October but sees it cut by five points in this poll compared to January. Don't read too much into it. Why are more people decided in this primary than the ones for Lieutenant Governor, Treasurer, and Senate where the candidates are better known? I have two theories. One is that it's the last question on the survey and people are sick of saying they're undecided about everything. The other is that in a race with just two candidates and where one is a man and the other is a woman it's easier to vote based on simple demographic reasons. Anyway, we have a baseline now for this race. Hagan and Neal are viewed as the viable candidates, and rightly so, but it is remarkable that even four months after launching his campaign Neal is not polling in double digits and is barely besting two candidates who aren't viewed as having a prayer. It's hard to figure what Neal's strategy is. He is keeping up an incredible schedule of appearances, seemingly speaking to any group of 25 people that will have him on a given night. That's a nice thing to do but it's just not how you get elected to the US Senate in a state as big as North Carolina. There are too many people here to win by talking to all of them. Carter Wrenn had a good post on that strategy over at Talking about Politics yesterday. He's also getting little traction with fundraising. I haven't seen this reported anywhere else yet but he only actually raised a little under 100k through December 31st. More than half of his reported 215k came from a personal loan of 120k. And he'd already managed to spend 76k in the first three months of his campaign, mostly on staff and consultants. He seems to have a whole lot of staff for a poorly funded campaign. In some ways I think Neal would be a stronger candidate than Hagan for Democrats this year. He has a lot more passion and fire for the race than she does, and almost every time they both go speak somewhere Neal gets far better reviews. But you don't get elected to the Senate by giving a good speech. You do it by running a strong campaign. And unless he turns it around quick he's going to get licked by Hagan in the primary. Perdue and Moore went on the air last month and since then the number of undecideds in the race has dropped. But the movement in the race hasn't really helped one candidate or the other- Perdue is up 4% from last poll, while Moore is up 6%. The Moore campaign has to be frustrated. When we started polling this race 13 months ago Perdue had a 12 point lead. In the time since then, for all the policy proposals and attack videos and tv ads both campaigns have done, there has been little movement in the margin between the candidates. Each campaign has increased its support- Perdue from 32% to 45% and Moore from 2o% to 31% compared to last January, but there has never really been any movement in the margin. The Moore campaign has a bunch of smart folks working on it and that's a good thing because unless they have some tricks up their sleeves for the last three months of the campaign Perdue seems likely to win by that same 8-12 point margin she's held pretty much continuously since this campaign launched. -Moore actually leads 40-37 among unaffiliated voters, not surprising since he has fared better than Perdue in polls testing possible general election match ups. -Perdue leads Moore by only seven points among white voters but has a significant 56-19 lead with African Americans. The black vote could be the difference maker in this race, and Perdue has consistently shown more strength there than Moore. -Perdue leads in every region of the state except Charlotte and is particularly strong in her home base of eastern North Carolina, where her edge is 59-23. Everyone's been wondering the last week where John Edwards' supporters were going to go. So we asked a question specifically about that so that we could produce a crosstab on whether his folks were going now for Clinton or Obama. A funny thing happened though. It turns out a lot more people say they supported Edwards for President now that he's dropped out than actually supported him when he was running. Since the start of 2007, Edwards never polled above 40% in any publicly released poll in North Carolina. But in the poll we did Wednesday night, 48% of respondents said they had supported him when he was running compared to just 52% who said they didn't. If they really had been for him, he might still be in the race! I thought that was amusing. But we have no more clarity on where his former supporters are going now than we did before. Of the group who said they were Edwards folks 41% are for Clinton and 41% for Obama. That's a wash, and the fact that even after a week there's so much ambiguity about who is benefiting from Edwards leaving the contest probably means that it isn't doing one candidate too much better than the other. -Clinton leads Obama 42-40 among registered Democrats, but Obama leads 62-25 among unaffiliated voters, hence his overall lead. -The gender gap is there but not huge. Clinton leads 43-40 with women, Obama leads 45-36 among men. -As our polling has shown in many southern states, Obama leads in every age group except with senior citizens. 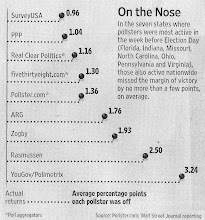 Richard Moore and Jay Reiff have both said that automated polls, like ours, are not credible. But seemingly whenever one throws them a bone they're all the sudden alright. A recent independent poll released by WRAL-TV in Raleigh shows Richard Moore as the leading candidate in a general election match-up. The most telling piece of information is the dramatic difference in the positive-to-negative rating of Moore and Perdue. Perdue's negatives are more than double Moore's. Moore: 35% favorable to 12% unfavorable. Perdue: 35% favorable to 27% unfavorable. A candidate's positive to negative ratio is one of the key indicators of predicting electoral success and Richard Moore is in a very positive position with voters. Rasmussen Reports, which conducted the poll, uses the same IVR polling that we do. It's just one more sign that when Richard Moore personally attacked our company last month it was just sour grapes about his performance rather than genuine concern about our methodology. I agree this particular poll was good news for Moore, and wrote about it last week here. But his campaign sure has flip flopped on the reliability of automated polling. This race continues to be very close. Dority leads Pittenger in five out of six regions in the state, but Pittenger's 51-11 lead in the greater Charlotte area is keeping it tied. Pittenger is far better funded than Dority and will likely start to pull away closer to the primary, but for now Dority seems to be benefiting from higher name recognition as a former Congressional candidate. Daughtridge has had a small lead ever since he entered the race. The Nash County legislator does extremely well in his home base in eastern North Carolina, leading 40-4. He also holds a slight lead on Folwell's turf in the Triad. This race was incredibly bunched up for most of last year but it looks like McCrory's entry is giving some clarity to it and moving it toward a two man race between him and Fred Smith. It could be a defining moment for the Republican party in North Carolina: do all their candidates need to have perfect conservative records, or are they willing to nominate a moderate who has the best shot at winning in the fall? Pat McCrory is the best known candidate in the field, and he also appears to be the most viable contender for Republicans to end 16 years of Democrats living in the Governor's Mansion. But he's not sufficiently conservative for some GOP primary voters. For most of last year those folks were splitting their support between Smith, Graham, and Orr. But Smith has run the most visible campaign and seems likely to be the best funded of that trio. So folks who are suspicious of McCrory ideologically appear to be starting to unify around Smith. PPP's last poll was the week before McCrory entered the race and he has started to broaden his support geographically since then. He's still by far at his strongest in the Charlotte tv market, but he is now polling in double digits in every part of the state, whereas he was around 4-5% pretty much everywhere except his home base previously. His progress has been particularly strong in the Triad, where he is at 17%, likely aided by all the attention given to the announcement of his campaign in Guilford County. Smith still leads McCrory in four out of six parts of the state, but McCrory's 64-8 lead in the greater Charlotte area is making the difference.